The land on which Dublin was settled is part of the territory once claimed by the Colony of Virginia. Read how the land was granted to those who fought for Virginia in the War for Independence and read the letter, or “patent” from President Thomas Jefferson to Lieutenant James Holt granting him land in the vicinity of Dublin. This gives a little more information about the Virginia Military District. Lieutenant James Holt was entitled to a grant in what would become Dublin. The patent was signed over to John Graham who sold the land to John Sells. Recites: To all to whom these presents shall come greeting, know ye, that in consideration of military service performed by James Holt, (a lieutenant for three years) to the United States in the Virginia Line on Continental Establishment, and in pursuance of an Act of the Congress of the United States passed on the 10th day of August in the year 1790, entitled “An Act to enable the officers and soldiers of the Virginia Line on Continental Establishment to obtain titles to certain lands lying northwest of the River Ohio, between the Little Miami and Sciota” and another Act of the said Congress passed on the 9th day of June in the year 1794 amendatory of the said act, there is granted by the said United States unto John Graham, Assignee of William Chamberlayne and Lyne Shackelford who were joint assignees of the said James Holt, a certain tract of land containing 889 acres situate between the little Miami and Scioto rivers, northwest of the river Ohio, as by survey bearing date the 30th day of October in the year 1796 and bounded and described as follows, to-wit:-Survey of 889 acres of land on part of a Military Warrant No. 1797 in favor of the said James Holt (the whole thereof being for 2666 2/3 acres) on the west side of the west fork of the Scioto, beginning at two white oaks and a sugar tree, upper corner of the river to Seymour Powell’s Survey No. 2419; running with Powell’s line passing his line and his corner north 89 degrees west 506 poles to an iron wood, elm and beech; thence north 8 degrees west 244 poles, crossing a branch at 232 poles to three beeches; thence N. 82 degrees east 500 poles to an elm, buckeye and hickory on the bank of the west fork; thence down the same south 8 degrees east 320 poles to the beginning, crossing a branch at 120 poles with the appurtenance. To have and to hold etc., unto the said (Grantee) his heirs and assigns forever. Signed by the President and countersigned by James Madison, Secretary of State. Virginia Military Lands are a body of land lying between the Scioto and Little Miami rivers, bounded by Ohio River on the south, and Auglaize, Hardin, and Marion Counties on the north. This tract in the southwestern part of the State contains about four million, two hundred and four acres. The state of Virginia, from the indefinite and vague terms of expression in its original charter from James I, King of England, in the year 1609, claimed all the continent west of the Ohio River, and of the north and south breadth of Virginia. But, finally, among several other compromises of conflicting claims which were made, subsequent to the attainment of our national independence, Virginia agreed to relinquish all her claims to the lands northwest of the Ohio River in favor of the general government, upon conciliation of the lands, now described, being guaranteed to her. The State of Virginia then appropriated this body of land to satisfy the claims of her state troops employed in the Continental army during the Revolutionary War. This district is not surveyed into townships of any regular form, but any individual holding a Virginia military land warrant located wherever he chose within the district, and in such shape as he pleased wherever the land had not been previously located. In consequence of this deficiency of regular original surveys, and the irregularities with which the several locations have been made, and the consequent interference and encroachment of some sections upon others, more than double the litigation has probably arisen between the holders of adverse titles, in this district, than in any other part of the State of equal extent. While the Connecticut Land Company struggled and disintegrated, Virginia on August 10, 1790, opened its military district, located between the Scioto and Little Miami rivers and the Ohio River and present-day Augulaize, Hardin, and Marion counties, containing 42 million acres. By that time, Virginia had granted nearly all of its lands allocated for veterans in Kentucky, but more land warrants remained outstanding. Because Virginia had reserved these lands from its western cession to Congress, the Land Ordinance of 1785 did not apply to this reserve. As a result, veterans and after 1794 speculators and others who had purchased land warrants, often for as little as $.20 to $1.00 per acre, claimed land anywhere in the district by the southern custom of “metes and bounds”; that is Virginia did not require rectilinear survey. Instead, “indiscriminate surveys” enabled the land to be platted and patents received, a process that also encouraged litigation well beyond the frontier period (example below). Because surveys overlapped, corners could not be precisely located, and gaps occurred. One survey, for example, had 118 sides and a left tract of unclaimed land within it. 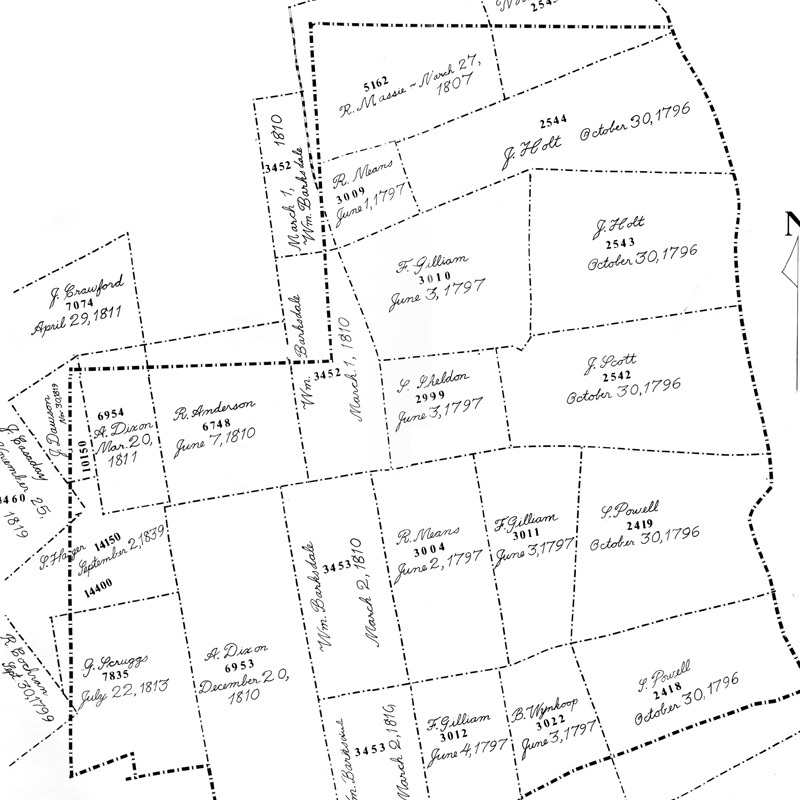 Often settlers who claimed acreage in the Virginia Military District paid a surveyor, such as Nathaniel Massie, who located claims, with a portion of their land, usually one-quarter to one-half of the acreage. Because of their expertise, surveyors usually located and kept the best lands for themselves. This payment procedure created many small-scale capitalists in land…. Most of this land, however went to someone besides a soldier. Indeed, only 35.1 percent of those men who men who received warrants for their military service had their lands surveyed. And only 15.4 percent received a patent, that is, title to all of the lands that had been warranted. For the most part, these patents went to single owners who claimed lots ranging from 100 to 1,000 acres, with the smallest patent for 5 and the largest for 5,333 acres. Speculators bought up most of the land warrants for the Virginia Military District. Nathaniel Massie eventually owned 28,400 acres, or 7.2 percent of the district, while Duncan McArthur held 21,400 acres, for 4 percent of the area. Usually, the more acres for which an individual received warrants, the more likely he was to have it surveyed and patented. Survey book No. “A”, page 291 said office, shows as follows: Surveyed for James Holt, 889 acres of land, part of a Military Warrant No. 1797 on the west side of the west fork of the Scioto; beginning at two white oaks and a sugar tree, upper corner of the river to Seymour Powell’s Survey No. 2419; running with Powell’s line passing his corner north 89 degrees west 506 poles to an iron wood, elm and beech; thence north 8 degrees west 244 poles, crossing a branch at 232 poles to three beeches; thence N. 82 degrees 500 poles to an elm, buckeye and hickory on the bank of the west fork; thence down the same, south 8 degrees east 320 poles to the beginning, crossing a branch at 120 poles. In 1784 Virginia relinquished its claim to lands to the northwest of the Ohio river in exchange for being able to award bounty lands (land grants in lieu of payment for military service) in Ohio’s “Virginia Military District”. (Connecticut made similar arrangement and ceded its claims in exchange for granting lands in the “Western Reserve” and “Firelands”). The Virginia Military District opened in 1794 though surveys were done there starting in the 1780’s. The first patent was granted there in 1796. Virginia issued bounty land grants there until Ohio achieved statehood in 1803.